This is the point at which, if I understand conventional wisdom, the Discworld novels start to become “good”. Also, more incidentally, this is probably the first Discworld book I ever read, far back in the depths of junior high. (All I remembered is the “mllion to one shot” gag, so, it was basically like reading it all over again.) And most incidentally of all, I’m pretty sure it’s the farthest I had read into the series, so everything from here on will be entirely new, cultural zeitgeist notwithstanding. Anyway, that “good” thing, though: as much as I have enjoyed the last several books on their own merits, Guards! Guards! definitely has some barely definable adult quality that the previous books have not had, though some have grasped at it. 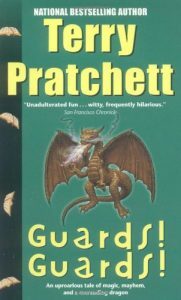 In addition to first introducing Ankh-Morpork’s city night watch and its world-weary, heroic-in-spite-of-himself Captain Samuel Vimes, a group character study that could have carried a book with no plot whatsoever, the novel also for the first time superficially grazes the inner political workings of the city at the dark, ulcerated heart of the Disc. It asks and perhaps answers the essential question of whether democracy or monarchy ought best be left to run amok through the lives of a citizenry that barely comprehends either and tends to cheer whichever of the two it has seen least recently. Also, and here is the only point at which it diverges from any standard reality to which you may be accustomed, there is a dragon. This entry was posted in Words and tagged Discworld, fantasy, humor on December 19, 2009 by Chris.